Both Moorfields and St John provide high-quality ophthalmic care to their respective populations. In each case, they were founded to care for patients suffering the blinding complications of trachoma (or the ‘Egyptian ophthalmia’). In 1805, John Saunders set up world’s first eye hospital called ‘The London Infirmary for Curing Diseases of the Eye’ in Charterhouse Square. In 1822 the Hospital moved to Finsbury Circus and was renamed The London Ophthalmic Infirmary, and in 1899 moved to its current location on Old Street. At a similar time, in 1882, the first hospital of St John was founded on the road to Bethlehem (this being in the Ottoman empire at the time). In 1960 the new Hospital was opened in East Jerusalem a mile north of the Old City, and in 2017 further surgical units were opened in Hebron and Gaza. In the early decades of the history of the Hospital Group, most ophthalmic expertise, including Hospitallers of the Order, came from Moorfields and St Thomas’ hospitals. But in recent decades, as financial support from the world’s Priories has grown (particularly from the Priories in North America and Australia) increasing numbers of surgeons and other health care professionals from across the world are now committed to the Hospital Group. Thus, in recent years, professional ties between ophthalmologists from across the world and St John, have been rekindled. But until recently, visiting surgeons from all Priories of the world, had no organisation through which they might keep abreast of medical developments, meet as a group, or offer specific medical advice, training or support. 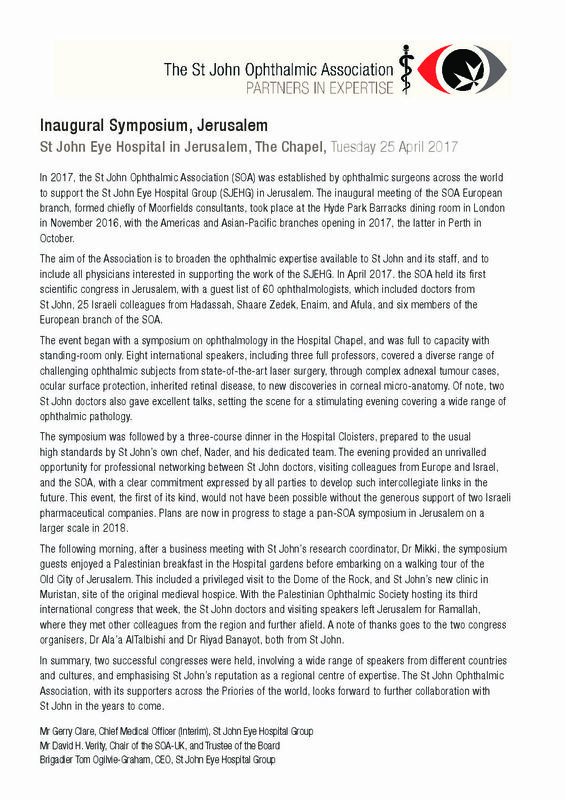 Following the Moorfields ophthalmic review of St John in June 2016, and in response to the clear need to formalise and consolidate international medical support for the Order, the St John Ophthalmic Association (SOA) was established in London in November 2016. By 2018, the Association will include ophthalmic surgeons from nine Priories across the world, and will exist in three parts. The UK arm (SOA-UK) is formed largely of ophthalmic surgeons in the UK, and also includes Members of the Board of Trustees of the Hospital. The North American association, currently headed by the Hospitaller of the USA, also includes Canada (SOA-NA). The third arm is the Asian-Pacific branch (SOA-AP), this including Australia and New Zealand. In 2017 ophthalmic advisory groups are being established in Singapore and Hong Kong, and the intention is that high quality reports on the Hospital Group’s activities can be circulated to all three factions of the SOA, ensuring that Hospitallers in all Priories, and their divisional or county/state representatives, receive accurate and up to date medical reports on a regular basis. Medical and nursing observerships between London and Jerusalem (in both directions). It is proposed that funds raised by the branches of the SOA may be used to support travelling bursaries for trainee colleagues. This would include assisting trainees to visit the medical faculties in the host SOA, as well as supporting medical students and trainees from the host SOA to visit Jerusalem. Clinical Fellowship(s) for a SJEHG ophthalmic post-graduate trainee. Doctors already receive in-house training in the units of St John, as well as Haddassah. Opportunities for hands-on training arise in North America and elsewhere, and the SOA may be able both to develop training Fellowships, and to help coordinate these. Coordinated teaching programs. Between the three branches of the SOA, and with high levels of expertise among senior doctors across the Priories, a regular 6–8 week visiting teaching program is achievable. Each SOA would commit to a rota for teaching at a frequency that is sustainable, this clearly depending on their geographical distance from the Middle East, and number of active members in the respective Association. Clinical research support; that is, the writing and publishing of scientific manuscripts. Advice on areas of clinical governance. National and International courses; that is, through their own influence at national and international levels, members of the SOA will be able to negotiate preferential training rates (as well as local accommodation in some instances) for trainees from Jerusalem. Such courses include national meetings, cadaveric courses, seminars, etc. Chlamydia trachomatis (trachoma, ‘The Egyptian Ophthalmia’)—a blinding yet preventable condition, blighted populations and armies in the Middle East (particularly during the Napoleonic Campaigns). As a result, the St John Eye Hospital and the Moorfields Eye Hospital, were established. The Hospitaller Knights of St John move to Malta and established the largest hospital in the Western World. King Henry VIII splits from the Roman Catholic Church. The Order of St John is dissolved in England and its properties seized by the Crown. Napoleon conquers Malta and then proceeds to Egypt. The British conquer the French in Malta. British soldiers returning home via Europe,brought ophthalmia with them—thus spreading it throughout Europe and into Britain where it becomes an increasing problem. John Saunders sets up the world’s first eye hospital, the ‘London Infirmary for Curing Diseases of the Eye’, in Charterhouse Square. The Hospital moved to Finsbury Circus and was renamed ‘The London Ophthalmic Infirmary’. The British Order of St John was re-established in Clerkenwell, London. Funds were raised in London to establish an eye hospital in Jerusalem to treat trachoma; thus the St John Eye Hospital was established, and the relationship with Britain strengthened. The Hospital moved from the Old City to Sheikh Jarreh. St John of Jerusalem Eye Hospital Group (SJEHG) was established in 1882. We are the only charitable provider of expert eye care in the West Bank, Gaza and East Jerusalem. In 2016 we treated over 125,000 outpatients (including 42,000 children) regardless of race, religion or ability to pay, including performing over 4800 major operations. There are 4.6 million Palestinians living in East Jerusalem, the West Bank and Gaza. Over the past ten years SJEHG has seen over 1 million patients across the region. The cost of our charitable work amounts to £8.3 million annually. The rate of blindness in the occupied Palestinian territories (oPt) is ten times higher than in the West. 80% of all blindness is preventable. By the year 2020 economic productivity loss for impaired vision in the Middle East is projected to grow from $2b (in year 2000) to $6.8b (WHO, 2003). The incidence of diabetes amongst the Palestinian community is very high, at approximately 12–15%. This is three times higher than in the West. Diabetic retinopathy affects up to 80% of all people who have had diabetes for ten years or more. 75% of Palestinians in East Jerusalem live below the poverty line. In 2016, our Hospital treated over 42,100 patients including performing approximately 3800 major operations. The Hospital is the first in the oPt to receive the prestigious Joint Commission International accreditation, the gold standard for healthcare world wide. The most complex eye-related cases are referred to the Jerusalem Hospital from Ministry of Health, UNRWA and St John medical centres across Gaza and the West Bank. It is located in the heart of the Old City, and on the site of the original Crusader hospital from where our charity’s history originates. 1/5 patients (and their companions) are denied permits to enter Jerusalem for medical care from the West Bank, which is why our satellite services were set up in the mid 2000s. HEBRON is located in the south of the West Bank, with over 500,000 people living in the surrounding villages. Our Hebron Hospital treated over 13,600 patients in 2016, and including performing over 500 major operations. Our new premises, opened in November 2015, is more central and has a much greater capacity. ANABTA is in the north of the West Bank. Many of its residents are refugees from Gaza, and it is easily accessible from Nablus, Tulkarem and Jenin. In 2016, our Anabta Clinic treated over 21,000 people. 2 million people are ‘locked in’ the Gaza Strip due to the blockade. It is one of the most heavily populated areas in the world. 72% of Gazans are refugees and 80% of the population rely on international aid (UNRWA). 1/3 of patients (and their companions) are denied permits to enter the West Bank and Jerusalem for medical care. Our original clinic opened in 1992 and our new bigger hospital opened in 2016, allowing us to reach more patients in the oPt’s most vulnerable region. In 2016, over 27,000 Gazans received eye care in our Hospital, including performing over 500 major operations. Our Mobile Outreach Programme was set up in 1980 in response to the difficulties experienced by patients who were struggling to reach our medical facilities. The programme takes essential eye care to some of the most remote and impoverished communities in the West Bank. In 2016, the programme reached over 18,000 patients. In 2017 we will be rolling out a similar programme in the Gaza Strip. Our Diabetic Retinopathy Screening Programme monitors diabetic retinopathy (retinal damage to the eye caused by diabetes which may cause blindness) among patients in the West Bank. The initial project (2012–2016) saw over 44,500 patients screened and over 13,600 parents were referred for diabetic retinopathy treatment. Findings from the project are to be incorporated into the Palestinian national health programmes. We took this programme to refugee camps in Jordan in 2016, the first time any of our services have been projected into a neighbouring country. Our Hospitals and Clinics employ 236 staff, including 33 doctors and 84 nurses. Our Medical Residency Programme trains local doctors as ophthalmic specialists over four years, investing in the shattered local infrastructure. Two residents graduated in 2016, three medical residents continued their studies and two new residents will begin their training in April 2017. Our Sir Stephen Miller School of Nursing trains nurses to become ophthalmic specialists; in 2016 six nurses completed our programme. Our Gaza Nursing Assistant Programme, which runs every two years, and aims to train registered nurses from Gaza in ophthalmic care. The course trained fifteen ophthalmic assistants in 2016. We work with Israel’s Hadassah Medical Center to provide doctors with otherwise unattainable advanced training in ophthalmology under our Joint Teaching Programme. In February 2016, a three year project was formalised to establish SJEHG’s research unit in collaboration with the Israeli Hadassah Medical Center. As well as setting an example about working cooperatively through humanitarian work, this research unit will help us improve our treatment of genetic eye diseases in the oPt.